My son’s current favorite bedtime story is the Gingerbread Man. He especially loves the part “Run, run as fast as you can, you can’t catch me I’m the Gingerbread Man!” So when he asked if we could make our own gingerbread man I happily agreed. After quickly finding a recipe online and scanning the cupboard to make sure we had all the ingredients, we started. As we were rolling out the dough I noticed one item I did not check I had: the gingerbread man cookie cutter. Not wanting to alarm my adoring spectator I decided to cut out the gingerbread men freestyle with a knife. This task was not as easy as it would seem. Each gingerbread man came out more deformed than the next, with lopsided or broken limbs or with heads growing out of arms. None of them seemed like they could run like the one from the story, or even limp for that matter. Nonetheless, after they were baked and decorated, my 3 year old loved them all. Whew! So after that ordeal, I needed something easy to make for dinner. I decided to make aloo tikkis since they are easy to shape (round!). Again I didn’t anticipate one small detail: everyone in my house likes to eat them differently. 1. I prefer my tikki slightly warmed with a side of green chutney mixed with a splash of kechup. 2. My husband makes a sandwich with a cheese bread roll, the bottom slice spread with green chutney and ketchup. He then adds a layer of crushed Nacho Cheese Doritos and then smashes the tikki on top. He covers the top slice spread with mayonnaise. 3. My one year old likes aloo tikki in a bowl with yogurt and ketchup all mashed together. 4. My three year old didn’t even eat one bite since he was so full with gingerbread men :). I love how the simplest dish can be enjoyed different ways. I am already imagining tomorrow’s chutney sandwiches I am going to be making with the leftovers…. **Note all spices can be adjusted to taste. 1. Mash potatoes in large bowl, when potatoes are still slightly warm. Add all spices and chopped coriander, green onion and green chili if using. Mix well. Taste and adjust spices and salt if necessary. 2. Shape the mixture into 3” flat rounds. Makes about 8-10 tikkis. 3. Beat 2 eggs in bowl and keep aside. 4. Lightly coat frying pan with cooking oil. Keep on medium high heat. 5. Take one potato round, dip in egg, then put in hot frying pan. Fry 2-3 minutes per side. Repeat with remaining rounds. 1. Put all items into a blender and blend into a fine liquid. Taste and adjust spices if necessary. 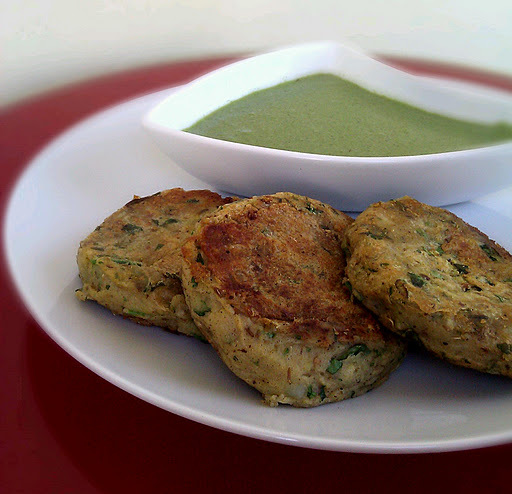 This entry was posted in Indian/Pakistani Recipes, Snacks/Appetizers, Vegetarian and tagged Aloo Tikki, Coriander and Mint Chutney, Indian, Quick Recipes, Vegetarian by thepantrydiva. Bookmark the permalink.